ZHAIRE SMITH 075/149 - 2018-19 Absolute Memorabilia Rookie THREADS Level 2 #RT-ZSM - Philadelphia 76ers. Condition is Like New. Shipped with USPS First Class Package. 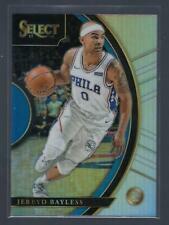 New Listing2013-14 Allen Iverson Prizm Silver SP #214! PSA 10 GEM MINT! LOW POP of 4! HOF! Buyer will receive the pictured card(s) in the description and title. Card(s) are in Near Mint or better condition, unless otherwise stated. Please make sure to check out our other listings!. New Listing2017-18 PANINI OPULENCE DARIO SARIC SILVER PARALLEL SSP 17/25!!! 2017-18 PANINI OPULENCE DARIO SARIC SILVER PARALLEL 17/25!!! FRESH FROM PACK TO PLASTIC. 💥 Zhaire Smith 💥 SG. ⚡️ Auto Autograph Gold Regal 09/10 Dominion Rookie Card ⚡️. 🎗 Autograph Rookie Signatures Gold Foil Regal Rookie Parallel 09/10 Card# RR-ZSM 🎗. 💎 First Round Pick - RC Rookie 💎. 🎗 Autograph Rookie Signatures Contenders Draft Picks College Ticket Parallel Card# 77 🎗. ⚡️ Auto Autograph College SP Contenders Rookie Card ⚡️. 💎 First Round Pick - RC Rookie 💎. 💥 JJ Redick 💥 SG. ⚡️ Auto Autograph Modern Marks 25/99 Immaculate Card ⚡️. 🎗 Autograph Veteran Signatures Modern Marks Parallel 25/99 Card# MM-JRE 🎗. 💥 Nerlens Noel 💥 C. ⚡️ Auto Autograph DC Bronze Prizm 67/99 Crown Royale Card ⚡️. 🎗 Autograph Veteran Signatures Die-Cut Prizm Bronze Crown Parallel 67/99 Card# CA-NNL 🎗. 💎 First Round Pick - Sixers #24 Retired 💎. 💥 Bobby Jones 💥 F. ⚡️ Auto Autograph Red Old School 045/175 Prestige Card ⚡️. 🎗 On Card Autograph Veteran Signatures Red Holo Foil Old School Parallel 045/175 Card# 16 🎗. BPL Sports Cards & Collectibles @ Facebook, YouTube, and Instagram. You are bidding on a 2018-19 Panini Status Top Status Insert card of Ben Simmons. This card is in near mint condition and is ready for any collection. Free shipping and happy bidding. UP FOR SALE IS THE ITEM IN THE PICTURES & TITLE. 💥 Hersey Hawkins 💥 SG. 🎗 On Card GOLD INK Autograph Veteran Signatures Gold Foil NOIR Parallel 44/49 Card# NC-HHK 🎗. ⚡️ Auto Autograph Gold Ink Noir 44/49 Panini Card ⚡️. 🔥 76ers-SuperSonics 🔥 star shooting guard 💨. 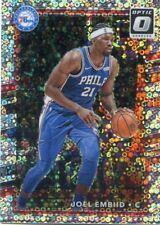 LANDRY SHAMET 2018-19 PANINI PRIZM PRIZMS SILVER #199 RC *PHILADELPHIA 76ERS*. Shipped with USPS First Class Package. 💥 Dikembe Mutombo 💥 C.
💥 Aaron McKie 💥 G/CH. 💎 First Round Pick - 2008-2013 Sixers Assisant Coach - Currently Temple Coach 💎. ⚡️ Auto Autograph Immaculate Ink 41/99 Immaculate Legend Card ⚡️. 🎗 Autograph Veteran Legends Signatures Immaculate Ink Parallel 41/99 Card# II-AMK 🎗. This auction is for 2017-2018 Panini Contenders Draft Ticket foil card of Ben Simmons, number 3 and #’d 39/99. Get in on the ground floor with these cards before they blow up and they get too expensive to purchase! The card has no visible damage to it. This item comes from a pet and smoke free home. Shipping is $3.50 within the USA and $15.00 to CANADA AND MEXICO, PLEASE USE THE INTERNATIONAL SHIPPING CALCULATOR BELOW FOR OUTSIDE NORTH AMERICA SHIPPING. Please check out my other great auctions going on right now for more great deals! Also remember to add me and my store as one of your favorite sellers and sign up for my news letter to receive emails when I list new items and emails with promotions and discounts! Up for auction is a..... 2018-19 Panini Prizm Fast Break Allen Iverson BLUE disco prizm card. Card is short print #43/175!. Cards are taken from pack to toploader to prevent damage. Shipping is $3.50 for first card, and $.50 for each additional card. If you have any questions, please contact me. Thanks and happy bidding. 💥 Shawn Bradley 💥 C. ⚡️ Auto Autograph Blue Sparkles Prizm 40/49 Spectra Legend Card ⚡️. 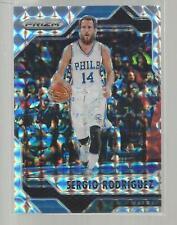 🎗 Autograph Veteran Signatures Illustrious Legends Blue Sparkles Prizm Refractor Parallel 40/49 Card# IL-SBL 🎗. 💥 Doug Collins 💥 SG/CH. ⚡️ Auto Autograph Heralded Sigs 96/99 Immaculate Legend Card ⚡️. 🎗 Autograph Veteran Legends Signatures Heralded Signatures Parallel 96/99 Card# HS-DCL 🎗. 2016-17 Panini Excalibur Squire Ben Simmons No. BEN SIMMONS ROOKIE Basketball Card. Prizm / Prism / Refractor / Holographic Foil / SP / SSP. 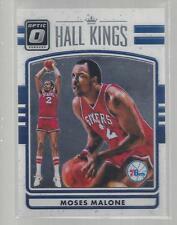 RC = ROOKIE CARD. Philadelphia 76ers Jersey #25. Ben Simmons 2018-19 Prizm Red White Blue Refractor #219 76ers. Condition is Brand New. Shipped with Penny sleeve top loader and PWE. 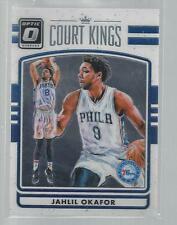 This is a 2018-19 Panini Crown Royale Red Rookie Royalty card of Zhaire Smith. This card is numbered 11/75. This will be a flat international rate no matter how many cards you buy. Allen Iverson 2017-18 Spectra Neon Blue #94. Individually #ed /99. (Read Below). BEN SIMMONS RC ROOKIE PANINI THE NATIONAL GREEN PRIZM REFRACTOR BGS 9.5 GEM /5! 2013-14 Allen Iverson Prizm Silver SP #214! PSA 10 GEM MINT! LOW POP of 4! HOF! 2017-18 PANINI OPULENCE DARIO SARIC SILVER PARALLEL SSP 17/25!! !